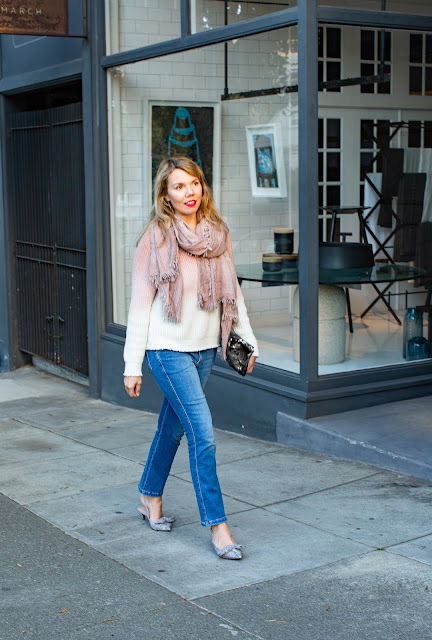 As I mentioned in last week's post, this is the warmest time of year in San Francisco, and while I'm enjoying the balmy 70s temperatures, I totally have fall on the brain. Luckily for me, the other 10 months of the year are totally sweater weather in San Francisco, and I managed to wear one of my newest purchases just a few weeks ago, before things started to heat up. 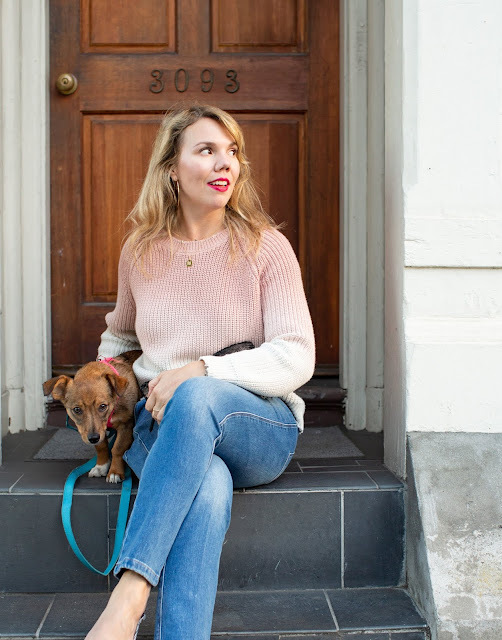 Now, statement sweaters are a big thing for fall—I will be featuring a trend report post on them here shortly—and while I always just say no to a trend that's not right for me, thankfully there are many interpretations of the statement sweater. I said yes to this one, and I already know it's going to be one of my favorites this year. I bought this sweater at the Zadig & Voltaire surplus store in Geneva (as I mentioned here) and while I may have been under the influence of the buy three, get an extra 20% off promo that was happening, I figured this sweater was a good buy regardless, because it's lightweight yet warm, and it's one of my favorite colors, blush pink. I also love that it has a cool gradient effect to it, as well as that broken-in look that a lot of Zadig & Voltaire items have. To me, that's enough of a statement; it has a the look of a classic shaker-knit sweater, but the ombré coloring gives it just enough edge to take me out of my comfort zone. It's all about deciding how far you are willing to go. I know wearing jeans and a sweater together is a pretty obvious paring, but let me just say, I freaking love these Frame jeans and wish I would have featured them here sooner. These were part of the Nordstrom Anniversary sale, and now they're 60% off ack, sold out, so let me tell you why I love them so much: they are so freaking soft and comfortable, and the higher rise holds you in unexpectedly well. I think the length is really flattering too, and it shows off your shoes (more on those later). I have been wearing these nonstop IRL. They run true to size (I'm in a 28, which is what I wear in most brands). I promised last week that I'd take a break from my A.P.C. 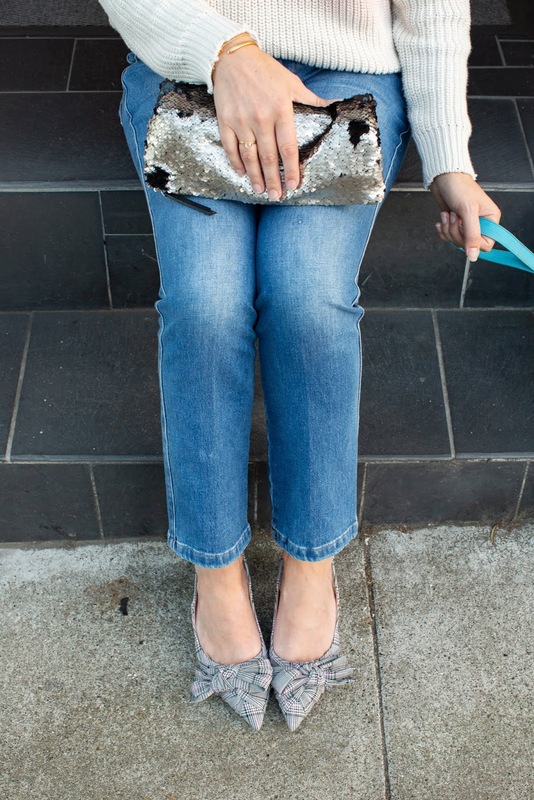 bag, so here's an oldie but a goodie, this fun sequined clutch last seen way back here. It's not a bag I'd normally carry for day, but it's perfect for a night out, and the two-tone silver goes with a lot. I like how it kind of neutralizes my look, along with these slingbacks I bought on a whim at Zara. I am a huge fan of kitten heels, and in spire of the fact that these shoes are not leather, they're incredibly comfortable. Also, I should mention, they're under $40! 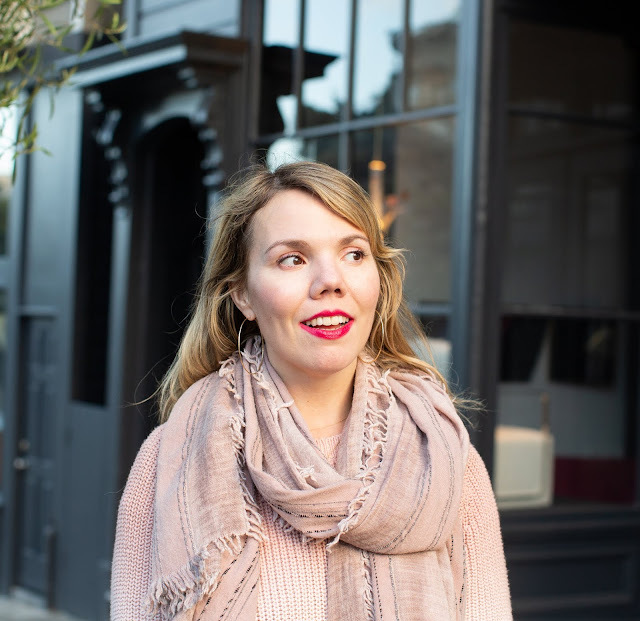 A funny thing about blogs versus real life—I almost always wear a scarf every day, and yet I rarely wear one here. I think it's because they tend to make my neck look short in photographs (well, my neck is short), but for whatever reason, I decided to wear one this time. It's also from my Zadig & Voltaire haul, and I can't wait to pair it with a gray or camel coat in the winter. 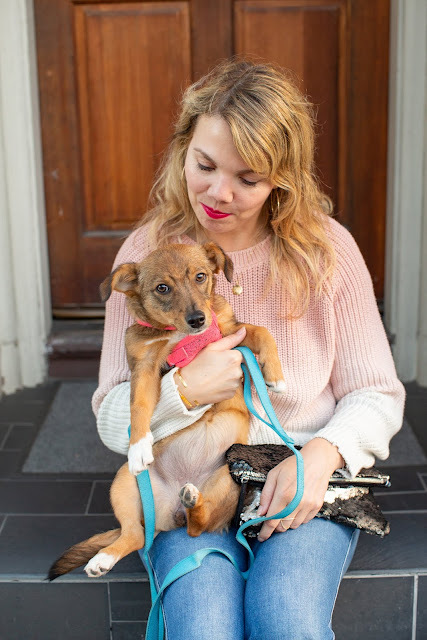 In case you were wondering who the adorable little pup is in these photos, meet our new dog, Zuni! She's a rescue, and we adopted her from Angel's Furry Friends, an organization based here in the Bay Area. She's about five months old and a mutt, and we love her to pieces. I have a feeling she'll be showing up here (and on my Instagram) quite a bit! Your flats are adorable and I love that sweater! This is just such a cute fall outfit! Love the shoes, cute pattern! I have fall on my mind too! I now it is fall but it really does not seem like it! I love how you are embracing fall with statement sweater. The color is so pretty! I love the gradient in that sweater and little bow shoes so cute!! You look stunning in this outfit. 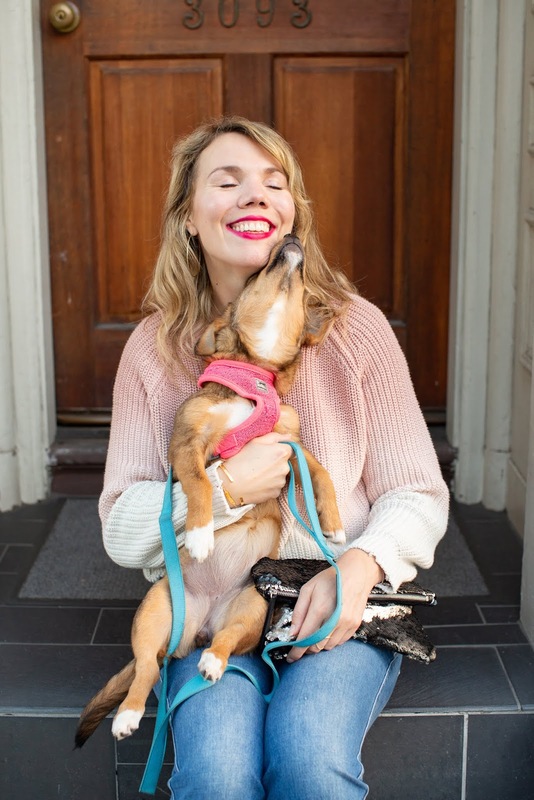 Thanks for sharing the look at the Top of the word Style linkup party. Beautiful Styling! I love the sweater and your shoes are sooo fab! 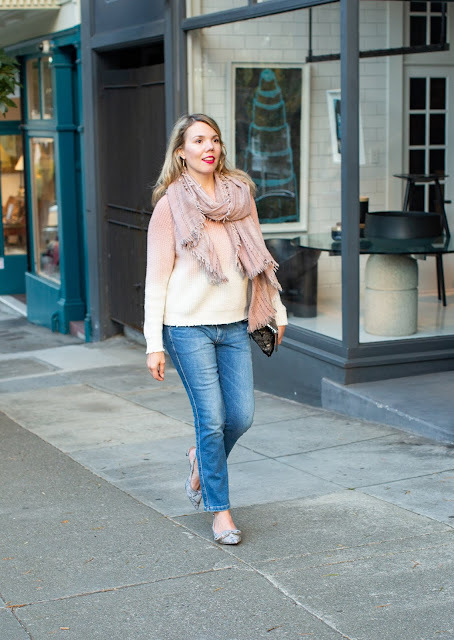 This sweater and scarf are such a pretty shade of pink! They look lovely together. Congrats on adopting Zuni. She can stay (on the blog, etc.) 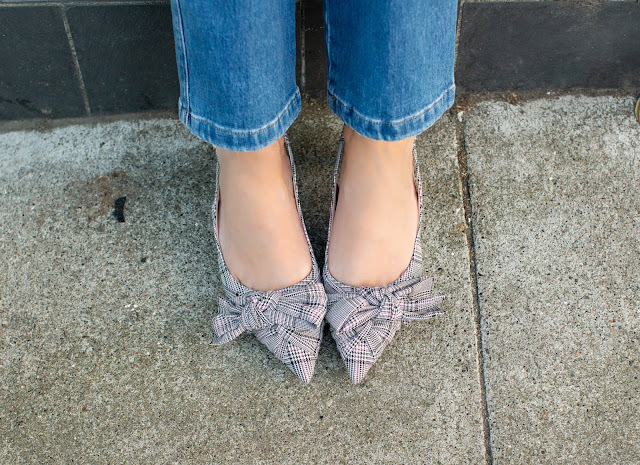 I love your gradient neutral sweater but I am in love with those Glen Plaid Pumps and what a steal they were, too! Such easy styling here but totally effortless and 100% chic!